In the wake of Germany’s unconditional surrender in May 1945 and Japan’s subsequent surrender later that July, across the world the Allied press proclaimed ‘Victory War is Over’! The truth for many Germans, particularly girls of the former Bund Deutscher Madel, was that a new war was just beginning. In Hitler's Shadow conveys the hopes, the horrors and the aftermath of the Second World War in the form of eye witness testimonies, diary entries and interviews. Through the eyes of the BDM girls, it recounts the struggle to rebuild lives destroyed by years of war, and how a country came to terms with terrible war crimes committed in its name. The result is powerful, sad, harrowing, humorous and shocking. 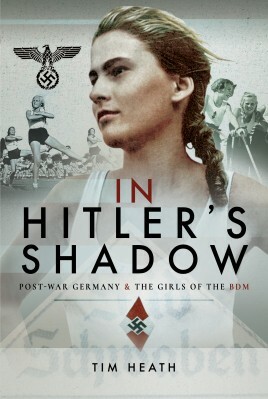 In the realms of the study of female Hitler Youth organizations in Nazi Germany, In Hitler's Shadow has no equal. Born in to a military family, Tim Heath’s interest in history led him to research the air war of the Second World War, focussing on the German Luftwaffe and writing extensively for The Armourer Magazine. During the course of his research he has worked closely with the German War Graves Commission at Kassel, Germany, and met with German families and veterans alike. Born out of this work, Hitler's Girls is his first book. He lives in Evesham, Worcestershire, with his partner Paula.